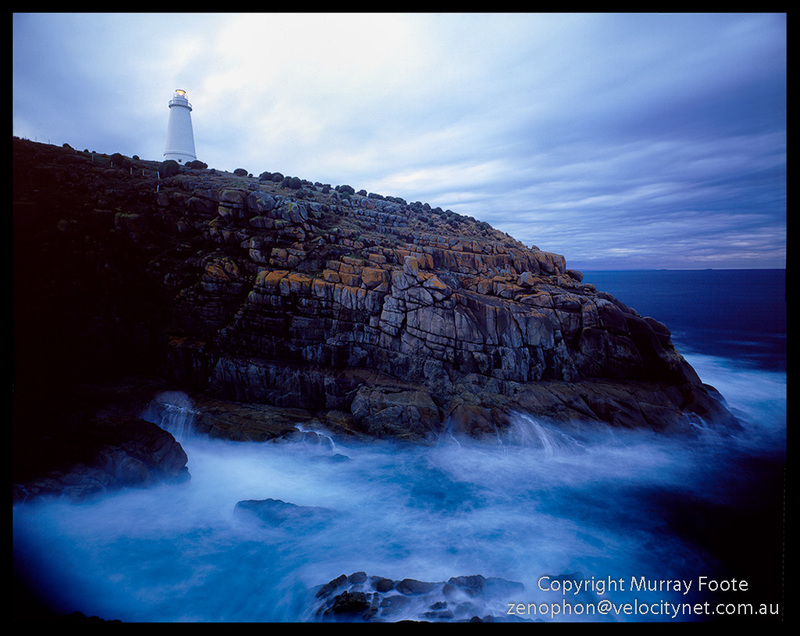 Cape Willoughby lighthouse is on the eastern end of Kangaroo Island, a substantial island that is 150 kilometres long and about 100 kilometres south-west of Adelaide. I visited there on 15th and 16th May 1987. On my way from Cape Nelson to Kangaroo Island in a hire car I made the mistake of taking the “direct route” which turned out to be dirt roads and took much longer than the highway. The signposts were so old and deteriorated that I had to stop and get out of the car to read them and the distances were in miles. (Australia switched from imperial measures in 1965; the signposts were much older than that). 65mm Schneider Super Angulon, Fujichrome 50. This is a time exposure around dawn on a cloudy morning and there was probably a front approaching. I would have reconnoitered the previous evening to determine where I needed to be and it required climbing down a cliff in the dark. Here we see a view of the cottages from the tower. The white walls would be for protection against winds rather than for security. The blur to the left of the houses would be a bird that I may not have noticed at the time. Further to the left of the cottages is a helipad. Cape Willoughby is the earliest South Australian lighthouse, built in 1852. It is 25 metres high and the light is 72 metres above the sea. 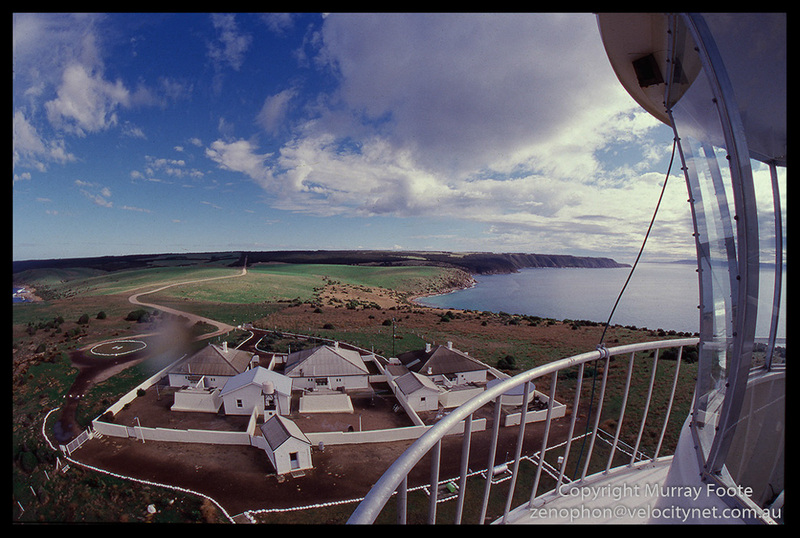 Its base is unusually wide for an Australian lighthouse. The original cottages were so poorly constructed that they were reported as “falling apart” the next year and new ones constructed in 1854. This entry was posted in Australia, From Dusk Till Dawn and tagged Architecture, Australia, Cape Willoughby, History, Kangaroo Island, Landscape, Lighthouses, Photography, seascape, South Australia, Travel. I visited Cape Willoughby this year. Fascinating history and beautiful spot. I am quite impressed that you climbed down to capture that fantastic dawn photo. Bravo! Actually more that that, come to think of it, I would have climbed down there in the dark and set up a large format system by torchlight, including carrying down an 8-kilo (18 pounds) tripod (no carbon fibre tripods in those days). That is very Ansel Adams! Amazing how far technology has come.